In honor of me turning 30, I’m making mix CDs of my favorite songs from each of my 30 favorite musical artists/groups. Read the introductory post for more background information on my 30 at 30 project. Reminder: there is no scientific rationale for this list. They’re simply my personal favorites. 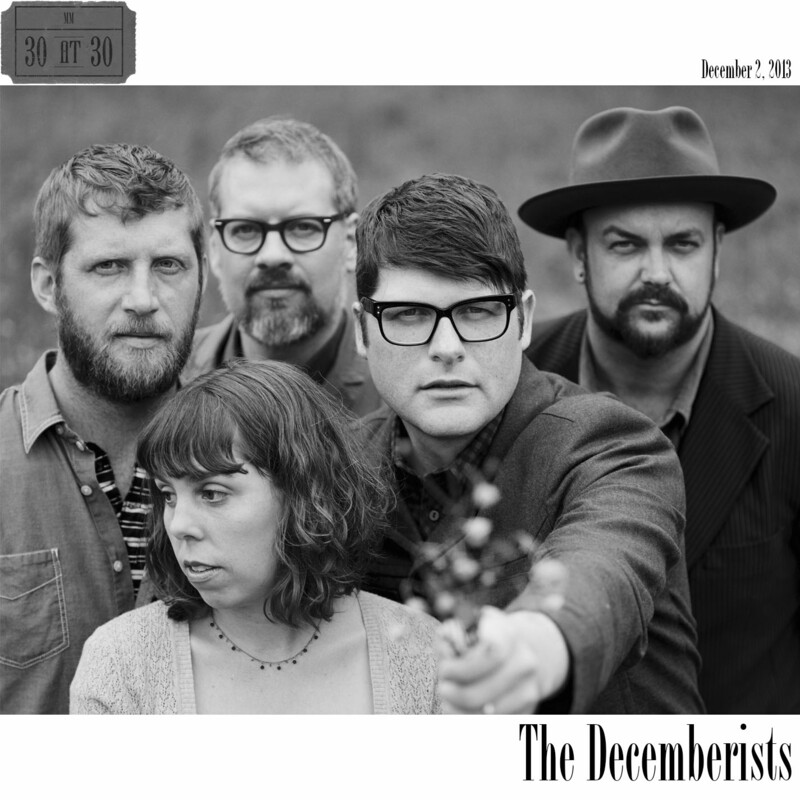 Coming in at number 27 is The Decemberists. The Decemberists are great storytellers. The fact that they tell their stories via folksy, rootsy rock songs is a bonus. Unlike the majority of the bands and songs that have and will find their way onto my countdown, The Decemberists’ best work comes when there is considerable distance between narrator and subject matter in their songs. If you’ve never heard of The Decemberists, “The Crane Wife 3” is the place to start. I have yet to find a time when I have heard this song pop up on shuffle—whether working at home, at the gym, hosting a party—when I felt inclined to skip it. It’s a song for all situations, a song for all seasons. Speaking of seasons, I often listen to The Decemberists amid the changing of the seasons, something that is especially meaningful in Erie, Pennsylvania. Our seasons vary drastically, and The Decemberists’ music seems to fit the changing from winter to spring to summer to fall and back to winter again. In fact, I ordered the tracks on this mix based on a loose seasonal structure. The opening “January Hymn” from there fantastic 2011 release The King is Dead begins things in winter. By the time “Down By the Water” hits at track five, spring has arrived. That song even includes the lines “The season rubs me wrong” (as is often the case in Erie when spring still feels like winter) and “The summer swells anon” (promising that warmth is indeed coming). The Crane Wife (5 songs) and The King is Dead (8 songs) make up more than 80 percent of this compilation. Picaresque (2005) and The Hazards of Love (2009) contributed the additional three tracks, including “The Wanting Comes in Waves/Repaid,” an electric-guitar infused track that shows The Decemberists are fully capable of turning the rock up a notch from time to time. On the heels of that hard-hitting, heavy rock track is the sing-along friendly (sung in a round, even!) closer “Sons & Daughters” with an optimistic message of a new start. Put this mix on repeat and it would flow right back into “January Hymn” for the start of a new year. *You know I took a special joy in the fact that I finalized The Decemberists’ CD in the month of December.